The application deadline for 2019 Hort Masterclass has been extended! Lisa Bassington and Patrick Noonan – Hort Masterclass Graduates. There is still time to apply for the 2019 Masterclass in Horticultural Business. Scholarship applications will now close Monday, 19 November. General applications to participate in the course are due Monday, 10 December 2018. Described as a mini-MBA, the Masterclass runs for 10-months and provides a comprehensive, affordable and accessible program for those looking to accelerate their horticultural career. This year, the nursery industry has several scholarships on offer; each valued at $10,000 to cover tuition costs. We’re on the brink of a green era, so we need to make sure we are propelling the careers of our future industry leaders, to facilitate this growth. Nursery employers and employees that have a passion for building their skills and the industry’s capacity are strongly encouraged to apply! What does the Masterclass offer? This global scholarship initiative has been developed as part of the Hort Frontiers Leadership Fund. Being the first of its kind in Australia, the Masterclass in Horticultural Business offers a tailor-made program to assist nursery growers and managers to take their careers, or businesses to the next level. You will network with like-minded people within the industry, and the broader horticultural sector; working towards finding solutions for shared challenges. As the first of its kind for Australian horticulture, you will learn from international leaders and study best practice examples in business management from around the world, which you’ll be able to apply to your business in a practical way – boosting business performance and staff morale. The course will kick off on 11 February 2019; offering a flexible online structure, covering several key learning modules such as innovation, global supply chain, and marketing and governance. Three face-to-face intensives covering two days are usually held at the start, middle and end of the course. The structure allows flexibility around current career commitments and provides a great opportunity for established individuals to learn and develop; accelerating their careers as industry leaders. 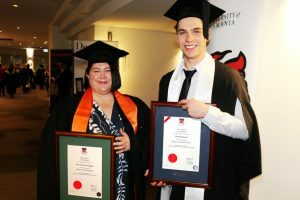 Upon successful completion of the course, students will graduate from the University of Tasmania with a Diploma in Horticultural Business and will be invited to attend a graduation ceremony, normally held in August of the following year. Early conferral is also an option.